I’m on my way home from my walk today, and it’s getting on towards dark. As I was coming down the mountain, I had what they commonly call a Team Dark attack … which is another way of saying: A chance to increase a person’s light quotient, you know? It’s a chance to observe the dark in ourselves; a chance to pack in the Light. So I composed a little song; it’s a very short song. It’s for those who worship Kali. I think I got this right: Kali is the goddess of destruction, right? Fire and destruction? More properly put: ‘Kali’ means ‘time’ and represents the death of the ego. Some people are very wicked about worshipping Kali. They feel it’s an evil thing to do. Kali is sometimes thought of in connection with black magic … That is to say: our infinite co-creative powers, hedged round by [and limited by] Ego. For the fire in you all, may it light the brightest light in your being. Link: “Goddess Kali,” http://www.goddess.ws/kali.html .. 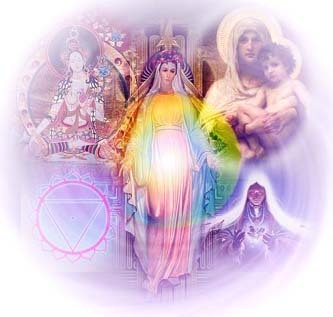 Image: Divine Mother, https://goddesslight.files.wordpress.com/2008/10/divine-mother1.jpg .. This entry was posted in Demonic realm, Dissolving black magic in the Light, Duality - polarity, Ego - higher self, Hinduism, Prayers - blessings - mantras - affirmations - white magic, Songs - music - hymns - kirtan, Songs by Alice, Team Dark, Transformation - personal alchemy and tagged black magic, darkness and light, Death, Demonic realm, destruction, divine feminine, Divine Mother, duality, ego, fire, invocations, Kali, light quotient, mantras, polarity, prayers, songs, Team Dark, transformation on 27 August 2017 by Alice B. Clagett.